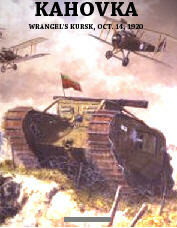 On October 14, 1920, the last major White offensive took place. It would become Wrangel's Kursk, a precursor to that more famous WW2 battle at Kursk but this happened at Kakhovka, a small town astride the Dnepr River. Unique for it was only the second time in the Russian Civil War that a mass tank attack would occur (the first was in the Summer of 1919), fully supported by DH9A bombers and infantry against a very well prepared Red defense consisting of three consecutive trench lines, mines and barb wire. WW1 was in effect "revisited". General Wrangel placed his blind faith in the tanks he had procured from the British, His tankers were well trained. He had even developed a combined arms approach. His forces, though outnumbered by 2 to 1 or more, continued to fight the "good fight" and had busted out of the Crimea in June, sent the Reds fleeing backwards for hundreds of miles with mass tank attacks and the ideal flat land. However, Wrangel was unable to secure the town of Kakhovka. The town had little real tactical value except for the fact the Reds held it. In September, several battles had been fought for it, each time the Whites were repulsed. Oct. 14th would be the last one. The Reds had created antitank formation consisting of MkV and FT-17 tanks and a unique American weapon, the Maklen 37mm AA gun. True, they only had a few of them , but tthe weapons ability to penetrate armor at very long distances was a stopper. Artillery units in AT mode also had been created. In manpower, the Reds had overwhelming strength if they did not flee from the tanks as they approached. The stage was set for the massive tank assault (in RCW terms) and for the final show-down between White and Red. Game scale is 1 hr turns, 800 yd a hex, company level, individual MkV, Whippet, Ft-17 tanks, Austin Armor Cars, DH9A Aircraft. The system never plays the same as once never knows how many units they can activate.